van Bergen Kolpa Lunchlecture, with reveal of location! On the 20th of September the location of the 24:UP 2018 will be revealed! For that occasion, Van Bergen Kolpa Architects will come to Vertigo to give a lecture about their projects and philosophy, which focusses on the balance between natural resources, the program and landscape. Van Bergen Kolpa Architects is a firm working on an international level designing buildings with a focus on food – they are the ones who designed Europe’s largest Rooftop Greenhouse Agrotopia (of 10.000m2 !). The works of van Bergen Kolpa Architects have been published on renown platforms and have won several prestigious awards and nominations. Make sure to look them for more information, and check out their interesting designs! The date of the 24up edition 2018 is announced! The 2018 edition will take place from friday the 5th until saturday the 6th of october 2018. More information will follow soon! The 24UP committee organizes a lunch lecture by Christian Rapp! In this lecture he will tell us about his profession as architect and master architect of Antwerp, as well as about the city itself. There will be a free lunch and through this lecture the location of the 24UP will be revealed! After the lecture you will be able to sign as a team for the 24UP at the CHEOPS desk. 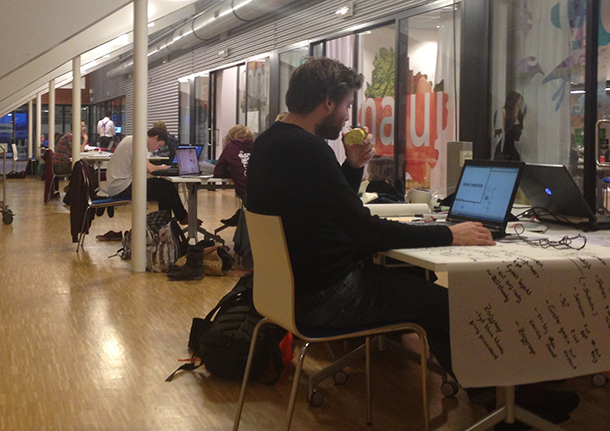 The 24UP is a 24 hour design contest in groups of four which will be held the 10th and 11th of February. After the 24 hours, every group will present the results and the jury will decide on a winner for who a price will be waiting! Just like last year, the 24up commitee started of their promotion with a 24warming up. Students in groups of two made a design for a bar on top of Vertigo in just a lunch break. This small design contest was given by Renato Kindt to warm up the students who would like to take part in the real deal, the 24 up itself. From the about 8 groups that took part, Renato himself chose a winning group and were rewarded with a few architectural magazines. The date of the 24up edition 2016 is announced. The 2016 edition will take place from friday the 10th untill saturday the 11th of february 2017. More information will follow.. In the early hours of Friday morning Omroep Flevoland pays a visit to make a report about the 24UP. For the radio and TV report they spoke with the organization and participants. Off we go! Pen scratching, tearing of sketching paper and computer tattle overrule the sounds of bouncing basketballs, stomping shoes and Ricochet hockey sticks in the sport centre Almere Poort since half past two. The clock is ticking and the participants start in good spirits and enthusiasm to the assignment. Come and warm up for the 24up with Renato Kindt! 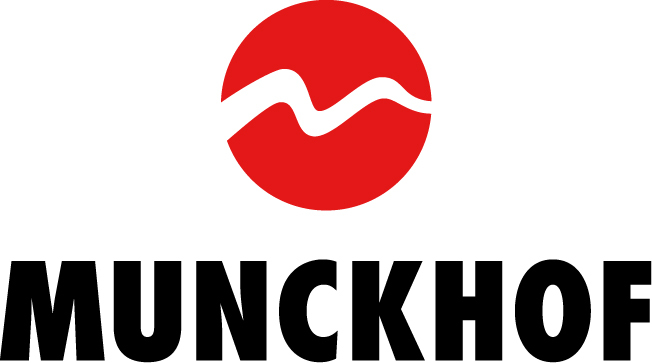 On tuesday january 6th 2015 in the lunchbreak at 12:45-13.30 Renato Kindt, teacher of hand drawing, will organize a 24-up warming up! 24 minutes. One secret mission. One secret location. (no, not really; it will take place in the hand drawing room). 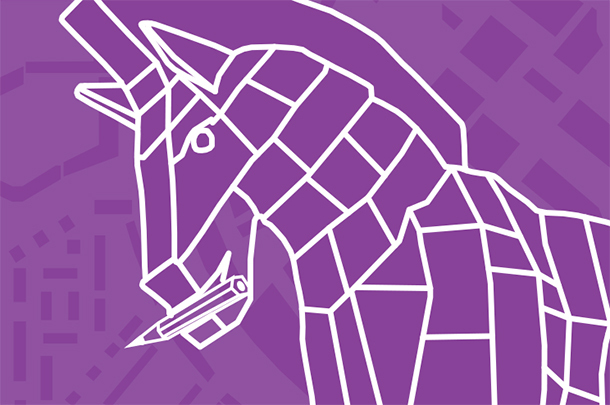 The purple horses all around in Vertigo already brought the message: You can now sign up at the CHEOPS-desk for the 15th edition of 24UP on the 15th and 16th of january! The mission and location will be epic and participation will merely cost 15 euros per person. So it will be (almost) cheaper than staying home! You can sign up for teams of four, but it is no problem to sign in alone; we will try to create a team for you. So do you want to battle for the legendary title of ‘Winner of the 24UP 2015’? And do you want to craft a beautiful horse building board? Sign up now at the CHEOPS-desk! Businesses have always supported the 24UP with great enthusiasm. We are very happy to announce the internationally operating Van Aken Architects as one of the parties backing us in the organisation of this design contest! Van Aken Architects will be present during the 24 hours to help students in their designing process, for participants THE chance to take part in a conversation with professionals and start business contacts. so our thanks go to the bankers “of the world of tomorrow” of ASN Bank! Their slogan is fully consistent with what the 24UP stands for as the engineers and architect of tomorrow take part. Now it is the participants’ task to reflect the sustainable image of ASN Bank in their solutions for the design brief. On the 15th and 16th of January, the 24UP will be held for the fifteenth time. The 24UP is a multidisciplinary design contest organised yearly by CHEOPS, study association of the build environment. For this contest, students of the build environment are given exactly 24 hours create a masterplan for an area given in the design brief. Throughout the years, this activity has grown more and more professional and well-known. This has resulted in creative and innovative solutions for municipalities as well as businesses. The location as well as the design brief will be kept a secret up until the day of the 24UP. To introduce the students to the design brief there will be several lectures from involved parties before the contest starts. During the contest, where teams consisting of four people work on all the different disciplines, many supervisors will be available for the students when they have questions. After the 24 hours are over, a professional and experienced panel of judges will judge the different masterplans and announce a winner. Afterwards all submissions will be combined into a final booklet which will be open for viewing within the faculty of the build environment, Vertigo on the TU Eindhoven campus. The Universityfund Eindhoven (UFe) will also be a sponsor of the 24UP this year. THe UFe was founded by alumni of the TU and supports education and scientific research and stimulates the studentculture with her contribution. The educative and studentlike character of the 24UP is strongly related to the goals of the UFe. We want to thank the UFe for their undeniable contribution to a unforgettable studentship for the participants. De opdracht van het 24UP 2007 in het kort: ‘bedenk een vernieuwend concept voor een cultureel complex, een creatief centrum van zowel productie als performance, dat aansluit bij de behoeften van de groeiende creatieve sector in Arnhem en tegelijkertijd het gebied Stadsblokken een eigen identiteit geeft. Het ontwerp moet geïntegreerd worden in de stad, inspelen op de dynamiek van de rivier en rekening houden met de voorwaarden van de EMAB-status’. Kortom, de onderlinge relaties en interacties tussen de aspecten water, architectuur, cultuur en stad vormen de essentie van de opdracht van 24UP 2007. 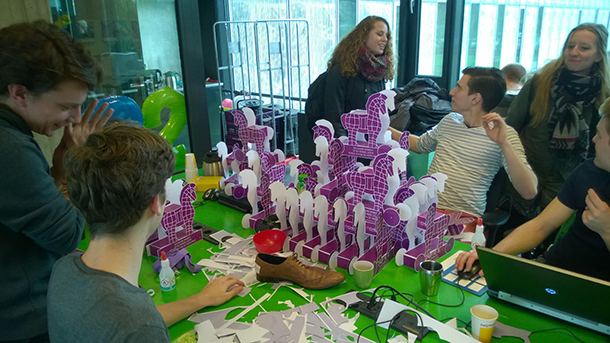 Het 24-uursproject is een 24 uur durende multidisciplinaire ontwerpwedstrijd voor bouwkundestudenten aan de TU/e, georganiseerd door CHEOPS, Studievereniging Bouwkunde. Het 24UP 2006 vondt plaats in Almere-Stad. Het thema was het te bouwen Annie M.G. Schmidt Huis & Park: een kunst en cultuur park waar kinderen de baas zijn. Het project is in de jaren ’90 geinitieerd door de Stichting Annie M.G. Schmidt Huis & Park. Annie M.G. Schmidt heeft tijdens haar leven meegeholpen met het ontwikkelen van het concept voor het complex. Het Annie M.G. Schmidt Huis wordt een park gemaakt in de geest van Annie: stout en tegendraads! Het Annie M.G. Schmidt Huis zal in 2008 voor het eerst haar deuren openen. In 2012 moet het gehele complex definitief klaar zijn. Tijdens het 24UP 2006 wordt van de 15 deelnemende teams gevraagd om een visie te geven op het thema ‘kinderen met kunst en cultuur in aanraking brengen, op een speelse manier’, een global plan te maken voor het Annie M.G. Schmidt Huis & Park, een gedetailleerd ontwerp van de theaterruimte te maken en een gedetailleerd ontwerp voor de tuin voor kunstwerken te maken.